Cider, fresh eating and cooking. McIntosh is without doubt one of the great North American apple varieties. Like its 19th century contemporaries Golden Delicious and Red Delicious,it has become a highly influential apple variety with numerous offspring. However unlike those varieties its popularity has not spread outside North America, and indeed most “Mac” production, remains centred in New England and across the border in Quebec and Ontario. 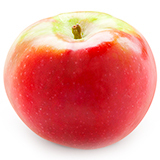 The apple was discovered by a John McIntosh, a farmer in Ontario in the early 19th century, and he and his family became involved in propagating trees. The McIntosh apple was ideally suited to the climate of the area, being a heavy and reliable cropper with good cold hardiness, and seems to achieve its best flavor in colder apple-growing regions. The McIntosh style is typified by attractive dark red or (more often) crimson colours, and a crunchy bite, often with bright white flesh. The flavor is simple and direct, generally sweet but with refreshing acidity, and usually a hint of wine – often referred to as “vinous”. In general these apples keep reasonably well in storage, but the flavour falls away quite rapidly – although remaining perfectly pleasant.Classic large, round apple for eating out of hand! Ultra-juicy white flesh, lightly tart flavor and excellent fresh apple aroma. A perky addition to salads. Excellent in applesauce and cider. Also used in pies.